St. Cuthbert is one of our Diocesan Patrons along with Our Blessed Lady Immaculate. St. Cuthbert was born about 634 and legend tells us that as a boy he used to tend sheep on the mountain-sides near the monastery of Melrose. In the year 651, while watching his sheep, he saw a vision of the soul of St. Aidan being carried to heaven by angels, and inspired by this he became a monk. Eventually he became prior at Lindisfarne (Holy Island) where he spent much time in evangelizing the local people. 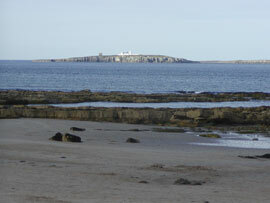 He wanted more solitude and time for contemplation so went for a short while first to either St. Cuthbert's Isle (off Holy Island) or, as some biographers suggest, St. Cuthbert's Cave in Northumberland. Eventually in 676 he moved to the Inner Farne, where he lived in solitude and peace for a while. While St. Cuthbert was on St. Cuthbert's Isle he would pray for long times at night on the shores of the sea in all weathers and seasons. Legend has it that the sea otters would come and sit at his feet warming them in the freezing North Eastern weather. Legend also has it that he, like St. Francis, conversed with the local ducks who would flock around him. He also made rosaries from the fossil crinoids washed up on the sea shore. To this day these crinoids (still washed up locally) are known as St. Cuthbert's Beads. He is recognised as one of the world's earliest wildlife conservationists and the Eider Duck is known locally as the Cuddy Duck or Cuthbert Duck in his memory. Eventually, he left Holy Island and the Inner Farne when he was called back to active service as Bishop of Hexham in 684. For two years he travelled the length and breadth of the North of England. He had the reputation of being a saint and a worker of miracles even in his lifetime. 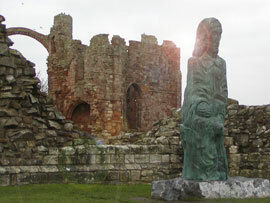 He returned to Inner Farne and died there on 20 March 687. St. Cuthbert was buried in his monastery at Lindisfarne, and his tomb immediately became celebrated for remarkable miracles. After his death, the Lindisfarne Gospels were written in his honour. St. Cuthbert's feast is kept on the 20th of March.